Under its incoming government, Serbia will continue on the path of European integration, but will have to face tough reforms to get there, said Aleksandar Vucic, who is slated to become prime minister. Vucic, president of the Serbian Progressive Party that scored a landslide victory in the March parliamentary elections, received the mandate from President Tomislav Nikolic on Tuesday (April 22nd) to form a new government. "The fairy tale is over. 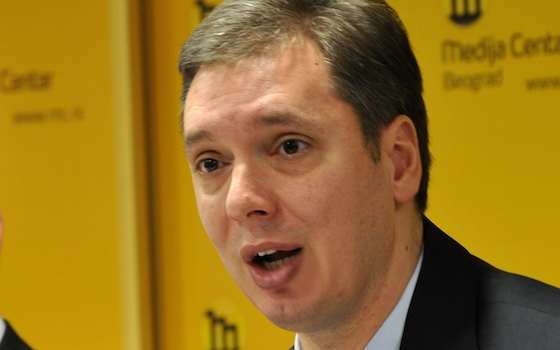 We'll have to work more and spend what we earn," Vucic said. "I hope that the citizens are capable and ready and that they will, no matter how they may vote in the next elections, be able after several years to appreciate our work and the fact that they will live at least a little better, because we have now done something good." He said the reforms in Serbia will be similar to those in Estonia and other Baltic states, which took two years. At a meeting with former German Chancellor Gerhard Schroeder on April 10th, Vucic said the most important tasks for Serbia are "the EU and reforms." "Serbia will do all it can to wrap up the negotiations with the EU by 2019," Vucic said. Dejan Vuk Stankovic, a University of Belgrade professor, agreed that EU membership must be a priority for Serbia. "Through the talks with the EU, Serbia will also carry out internal reforms and become a more organised society," Stankovic told SETimes. Economic reforms have to be implemented, he added, one of which may be the unpopular reduction of pensions. Trade and Telecommunications Minister Rasim Ljajic agreed, telling SETimes that the success of the new government would be measured by the number of new jobs created. "If we reduce unemployment and create new jobs, we will have done a good chunk of the work," Ljajic said. Miodrag Zec, an economics professor at Belgrade University, warned that there are no easy solutions or shortcuts. "The authorities have admitted that the state has fallen apart, that it is expensive, that the labour law is no good. But we have no solutions," Zec said. "There is no answer to the question of whether we want Serbia to be a liberal or a social state. We want a liberal state when we pay taxes, and a social one when we get medical treatment." One of the new government's priorities will be judicial reforms, according to outgoing Justice Minister Nikola Selakovic. The outgoing cabinet drew up a National Judicial Reform Strategy for 2013-2018, but certain deadlines were extended due to the March 16th snap elections. "Only the deadlines have been extended. Updating the action plan does not pertain to our competent decisions due to be carried out, nor to the essence of the acts and activities that are to stem from the implementation of the plan," Selakovic said. Judge Ljubica Milutinovic, a member of the Judges' Association of Serbia, said numerous reforms are behind schedule. The Association "is worriedly watching the delay in amendments to the necessary laws and their harmonisation with European standards." Some said that the reforms are Belgrade's last opportunity to rebuild the economy. "Since 2000, we've been hearing how we must join the EU, must reform the economy and judiciary, and that still hasn't happened," Miroslav Davidovic, a Belgrade salesman, told SETimes. "Perhaps now it will be done, because I think this is our last chance, otherwise we'll go bankrupt." "Serbia Focuses on EU and Reforms"